Co-edited by Raven Stubbs and Adelia Wilder-Doctor. 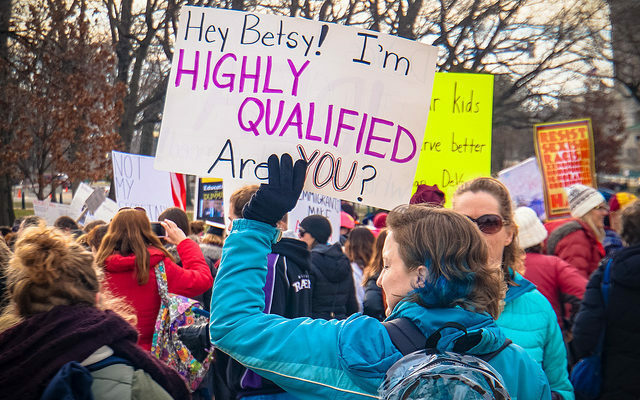 Now that Betsy DeVos has been confirmed as the U.S. Secretary of Education––despite fierce opposition from both Democratic and Republican constituents––you might be wondering if there is any point in protesting the hegemony of the Trump administration. Today, pessimistic posts from educators and parents around the country flooded my social media timelines. For many Americans, the prospect of blocking DeVos’s confirmation was the last symbol of this nation’s democracy, especially in light of the rapid succession of Trump’s recent executive orders. By blindsiding us with swift injunctions, Trump’s power seems to have insidiously eroded our conviction that we have power as citizens. But we must not allow Trump’s ploys and fear tactics to drive us into a state of apathy that we will regret later. 1. Resist the urge to distance yourself from politics to cope with burnout. Intentionally push yourself to become more civically engaged when you feel demoralized and overwhelmed with apathy. In fact, blog or journal about your reaction today, and revisit those thoughts and feelings as a reminder of your sense of urgency. If your advocacy begins to elicit or trigger mental health challenges, step back for a while and prioritize self-care. But do not lose perspective of what is at stake. Find your place within the movement and disengage as needed, but do not abandon the cause. 2. Stay abreast with state and federal policy decisions, so that you can organize and push back in a timely manner. Follow the social media accounts of Betsy DeVos and the U.S. Department of Education. Subscribe to the many newsletters published by the U.S. Department of Education, or sign up for email updates. Familiarize yourself with ESSA(Every Student Succeeds Act), which Obama signed to advance “equity by upholding critical protections for America’s disadvantaged and high-need students”. Also, stay in contact with your state education department to keep up with education policy on the local level. Do not allow bureaucracy to intimidate you, and remember that you have the power to hold Betsy DeVos accountable. Our public officials work for us––the public. 3. Find out whether your senator voted for DeVos here. If so, rescind your support in mid-term elections; if not, still share the list with those in your network, especially those from traditionally Republican states. Remember that these local elections played a majorrole in DeVos’s confirmation. State senators may not have as much visibility as the POTUS and his cabinet, but they have just as much decision-making power. Now is the time to learn more about state politics. Mid-term elections will take place next year, on November 8, 2018. 4. Advocate for ethnic studies in public schools. During the next four years, backing culturally-responsive teaching will be crucial, especially considering Trump’s willful ignorance concerning racial justice issues. We can expect an agenda to overhaul any promising initiatives to include ethnic studies in K-12 curricula. Ethnic Studies Now has been a leading voice in this movement. Read and share their Ethnic Studies Toolkit and policy briefs. The National Council of Teachers of English (NCTE) also released a position paper on ethnic studies in K-12 curricula just 3 weeks ago. Follow and subscribe to these organizations, and support them fiscally if and when you can. 5. Join an organization that combats the school-to-prison pipeline and/or supports restorative justice initiatives in schools. During DeVos’s confirmation hearing, she refused to commit to maintaining the requirement that public schools submit data to the Department of Education’s Office for Civil Rights about their rates of discipline for students of color and those with disabilities. And she has never publicly acknowledged the reality of the school-to-prison pipeline, despite extensive data showing alarming racial disparities in suspensions, expulsions, and school-related arrests. However, the ACLU, Discipline Disparities Collective, and Justice Policy Institute all have published infographics, policy briefs, and research studies on issues related to the school-to-prison pipeline. In addition, Teaching Tolerance has created a Toolkit for Restoring Justice, and Edutopia––an online publication for educators––has a plethora of guides for successful implementation of restorative practices. Now is the time to become informed about the role that schools play in upholding prison-industrial complex via the school-to-prison pipeline, especially considering the fact that 3 of the nation’s 5 largest school districts have more police than school counselors.